The Service, Office and Retail Workers Union of Canada (SORWUC) was an independent union, established in 1972 by a Founding Convention of 24 women, with the intention of representing and organizing occupations that were not included in the traditional trade unions of the time. The union developed out of the Working Women’s Association, an organization that sought to provide support to the adversities facing working women, such as obtaining equal pay, day care provision, and job security. SORWUC was an unaffiliated, feminist, member-controlled union, and the constitution stated their aims as being: to bargain collectively on behalf of members; to improve working conditions; and to help provide job security. Their constitution was "designed to allow and encourage maximum worker participation and decentralization of control over decision-making and negotiations by limiting the salary and terms of office of leaders, and by requiring referendum votes on major union decisions." (1) While many By 1976, SORWUC had organized four day care centres, five social service units, one legal office, one student office, and a tuxedo rental store. SORWUC also began organizing bank workers in 1975 and eventually established a specific chapter for the workers in the finance industry, Local 2, United Bank Workers, and later, Local 4, Bank and Finance Workers. The union was financially supported by its members and by donations from other unions and organizations, and ran its offices on a volunteer basis. The majority of the workers SORWUC organized were women, and often they fought for equal pay, maternity leave, living wages, and legislation against sexual harassment, and gender and race based discrimination in the workplace. SORWUC gained public attention in 1978 when the union became involved in the Muckamuck Restaurant strike that developed into a long dispute between workers and management which was never resolved.While SORWUC was a national union, operating in both Saskatchewan and B.C., it was primarily active in British Columbia, its place of origin and the location of its headquarters. After over a decade of organizing, SORWUC disbanded in 1986 due to lack of funds and the prevalence of more nationally focused unions. Records were created by the Service, Office and Retail Workers Union of Canada (SORWUC) during its active years of 1972 to 1986. The original accession was donated by SORWUC in 1987. Subsequent accruals are from unknown sources. The first accrual (boxes 9 to 12) was acquired by the University of British Columbia Rare Books and Special Collections in 1994 and the second accrual (boxes 13 to 21) was acquired after 1994 and prior to 1998. Boxes 22 and 23 were accessioned in 2017, and are assumed to be a part of the pre-1998 accrual which had not yet been processed. Boxes 24 and 25 were accessioned in 2018, and are also assumed to be a part of the first accrual. 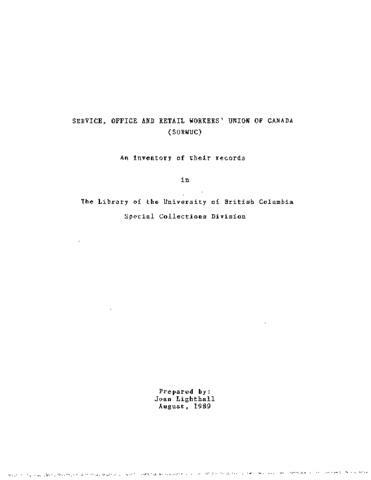 This fonds contains records of the Service, Office and Retail Workers Union of Canada (SORWUC) from their active life between 1972 and 1986. The records pertain to the functioning of the National Headquarters, Local sections and the union as a whole within its communities. The content of the records is primarily focused in Vancouver and the Lower Mainland, but the union's influence reaches a national level including activity in the prairies, Ontario, Quebec and the Maritimes. While the central concern of SORWUC was directly related to unionization, the records also concern feminist activity and the pursuance of equal rights for women in society. The material is in the form of correspondence, financial records and statements, various publications, and photographs. The material of the original accession was donated to UBC's Rare Books and Special Collections by SORWUC in 1987. The first (boxes 9 to 12) and second (boxes 13 to 21) accruals were donated from sources without available information. The physical arrangement of the fonds is respectful of the original order. Files have retained the original titles used during their active life. Because of the lack of clear or intentional arrangement of the files, the intellectual arrangement described in this finding aid has been attributed to the fonds in order to express the presence of series throughout the material, and does not necessary reflect the proximity of files within the original order. The attached PDF finding aid articulates the arrangement of the original accession of 1989 and the first accrual of 1994. Further accruals have been described in the finding aid available on this database. Description updated by Claire Williams in July 2018.